Baptisms are great. They are the best part of the job. There’s nothing quite like it. Over the years as senior minister I have had the privilege of doing the baptisms. It’s my job after all …. 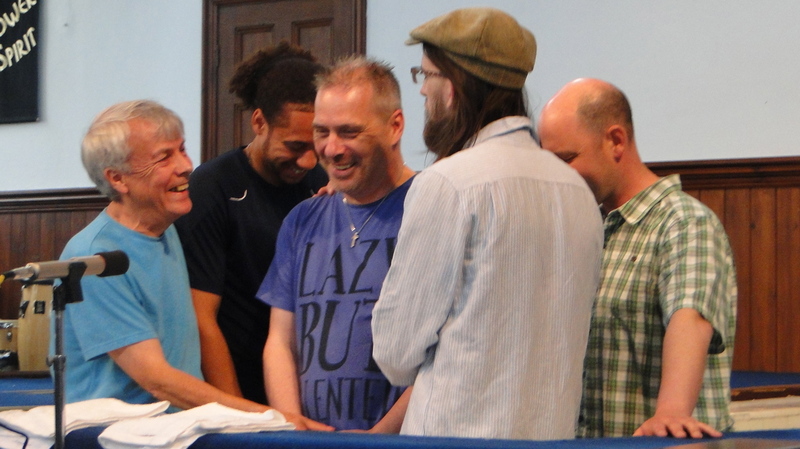 All baptisms are fantastic, but the best ones (if I can speak like that) are those of people who have recently found faith and been reached by the love and friendship of our church community. We are on a journey as a church. We have been looking seriously at the model of discipleship and mission that Jesus gave us. We are feeling challenged about so many things that I have been sharing in our recent inside out series. One of those things is Jesus’ clear expectation that an ordinary disciple will be a disciple-making disciple. There are not special people in our churches who do that. We can all do that. As I wrote a couple of weeks ago we can all do the stuff. As a Baptist church we have operated a certain unwritten assumption. The assumption was that if you wanted to be baptised you had to come to a church sponsored service and be baptised by a pastor, elder or in our case ‘the minister.’ It is this kind of behaviour that has for years reinforced the chasm between clergy and laity that I was lamenting a few weeks ago and finds no support in the ministry of Jesus. Furthermore what it means is that we are saying that only a few people can carry out that part of the Great Commission (Matthew 18:18-20). If ‘Go and teach’ is also a part of the Great Commission that is reserved for the ‘special’ people then there is little left in the Great Commission for the ordinary Christian. I think we’d all agree that there was nothing about Jesus that suggests it should be like this. As I have coached our people, and watched them prepare to do their first baptisms, I have become aware of how important this is for the baptiser as well as the person being baptised. After all it is their journey too. They have reached out, spent time with, prayed for, served and sacrificed for their friend to come to Jesus. They will still do all those things into the future as they continue to walk a discipleship journey with them. This is, in that sense, their baptism. An important marker for them as well as the baptised. I’m gutted to not personally be involved in any baptism, but that is totally eclipsed as I see the joy and privilege of those released and empowered to baptise those they have journeyed with. It’s another nudge closer to seeing and believing that every disciple is a disciple-making disciple. I’m well excited about that. What an amazing day we all had yesterday. Will be ‘passing’ this email on to various friends. You are an inspiration to us all Simon – but it looks like Connor is going to be a close second. Thank you for having such an abundance of love for Jesus that you do not feel threatened by the growth of those you disciple.